As food and drink marketing and PR specialists, the Pelican team is constantly looking at what’s driving the retail and foodservice markets, so that we can adapt our campaigns to deliver the best outcomes for clients. Many aspects of our lives are being affected by social, technological, environmental and political developments, at what feels like an ever-increasing pace. But which are the most influential trends? To answer this question, we’ve teamed-up with NPD specialist Celia Holt to produce the Food Trends Report, a summary the key Mega Trends affecting the food and drink sector. So, here’s a brief look at the top five Mega Trends. Ever since the Brexit vote, the political landscape seems to have been in a state of flux. You can argue that populism in the form of Trump, Corbyn and Macron is a reaction against the political status quo, years of austerity or the younger generation exerting their political clout. Whichever it is the economic impact on the food industry is significant. The falling pound has been a blessing for food exporters, but it has led to a rise in UK food prices. This, combined with the economic slowdown, is likely to put the squeeze on the spending power of UK households, which in turn will help maintain the growth of the discount retailers. This is not only a UK phenomenon. On day one of taking ownership of Whole Foods, Amazon reduced prices by as much as 43%. We can expect more and more downward pressure on price, only brands with a strong proposition will thrive. 10 a day fruit and veg for a healthier you! As more of us eat on the go, foodservice operators are responding by developing new healthier menus and formats such as Veggie Pret. Other effects include the growing adoption of apps such as ‘Snap It’ that helps people make healthier food choices and ‘My Fitness Pal’ that allows users to track their calorie intake and exercise. Wearable technology is also contributing with the development of the Apple Watch and the Fitbit which allows people to track their daily exercise. For anyone born after 1995, technology has simply always been a part of everyday life. Generation Z have been used to the internet and smart phones from a young age and it’s shaped their approach to every aspect of their lives. Generally, they are happy to share many aspects of their day-to-day lives online, they shop online, are happy to share personal information with brands and believe that businesses should act to ‘do good’ in the world. They tend to be less focussed on traditional career paths and value experiences over possessions. This shapes their attitudes to brands. They actively seek out brands which they believe are ethical or which offer new or unique experiences. In contrast, there is also a growing trend for Digital Detox, creating tech-free spaces in our lives, such as device free holidays or people valuing traditional pastimes for example craft baking, which may explain the popularity of the Great British Bake Off. The fifth mega trend is social conscience. We constantly hear that climate change is the result of our modern lifestyles and many of us want to do something to offset the effects of consumerism. People are increasingly interested in brands that minimise their effects on the environment or even better are acting to make things better. We expect to see many more examples of re-use or take back of consumer goods and food brands making claims about sustainable packaging and animal welfare standards or CSR benefits, for example the Co-op promising to use only British meat. In addition, we’ll see the development of more vegetarian and vegan food products and more meat alternatives such as the ‘Impossible Burger’ made with potato, wheat and coconut fat, the product visually resembles ground meat, even when raw. Thanks to an ingredient called heme, the molecule that makes meat taste meaty, the Impossible Burger even bleeds. Change is happening faster than it’s ever happened before. These mega trends are already having a significant effect on the food industry and brand owners need to assess how they’re going to react. 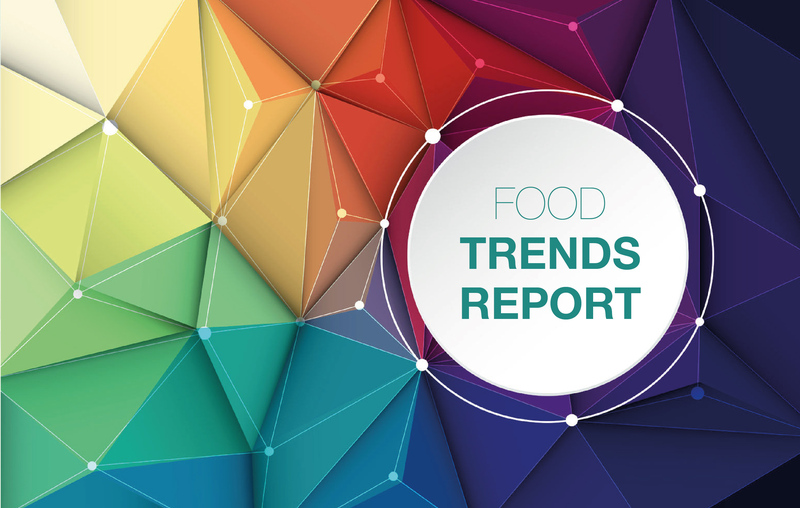 If you’d like a copy of the Food Trends Report, then contact Michael Bennett at Pelican Communications on 01457 820807 or email him at Michael.bennett@pelicomms.co.uk or fill in the contact form below. Pelican Communications is a specialist in the environment, food and drink, outdoor and leisure and packaging sectors and offers a range of services such as media relations, brand management, event management, design and people development. Contact us for marketing and communications expertise.